As with most businesses, trainers tend to have five main sources of training work: existing clients, recommendations from existing clients to their network, introducer referrals, associate work, and speculative enquiries. Realistically, the first four of these sources are the most reliable for winning contracts and yet most of us put the bulk of our energy, at least initially, into attracting business from speculative enquiries. When it comes to attracting new business, there’s nothing better than a referral or recommendation from a happy client. One of the biggest obstacles to securing a new contract is the prospective client’s wariness of the unknown so if you come with the seal of approval from a trusted person in their network, you’re potentially streets ahead of your competitors in a prospective client’s eyes. But how can you attract referrals and win more training contracts as a result? Your existing clients will need to be coached to make referrals, reminded regularly and you’ll need to make it as easy for them as possible. I’m a great believer in the adage, if you don’t ask, you don’t get. One of the most effective ways to secure a referral is to ask for one from your existing clients. You may feel uncertain about how to do this. Won’t it smack of desperation? When should you ask? How should you word it? Won’t it be embarrassing for you and your client? These are common concerns. In my experience, the best time to ask for a referral from a client is when you’re actively working with them but perhaps nearing the end of your current project or contract. This is the time when you’re still at the forefront of their mind and they have hopefully seen the value you provide. I find it works well to say, “If there’s anyone in your network who you think could use my services, I would welcome a referral”. You could even try adding ‘Referrals appreciated’ or ‘Referrals welcomed’ to the bottom of your email signature, newsletter or business card to let them know that you’re open to referrals. If a client seems reluctant to make a referral, it’s worth asking why. There may be something that they’re unhappy with that they haven’t voiced. If you can show a willingness to resolve any issue, if possible, this can help secure future referrals. This is a key point. Before you ask for referrals, you should be sure that you deliver what you promise and that you add value for your clients. The person making the referral wants to know that they are sending their contact to a reliable business as a poor referral can damage their reputation too. Many clients would be happy to give you a referral, but they may not be sure how to go about it, especially if they’re not 100% sure how to explain your training services or experience. You could create a short document that outlines your business, skills and training experience that they could refer to or even pass on to their contacts. Try focusing on showing what you do and what sets you apart. Alternatively, you could pass on some case studies about recent client results or create a short e-brochure showcasing your services and clients. Another tactic is to ask clients for a recommendation on LinkedIn or a review on Facebook, for example. You could even give your clients a Q&A-style form to complete for a review or email them an example of how other business reviews look, so they know what you’re expecting. Your clients are busy – if you can guide them, they will appreciate it. Another way to encourage referrals is to identify your niche and become known for your niche-specific knowledge. I’ve known trainers who work exclusively with law firms or television production companies as just two examples. When you niche, you have the opportunity to develop in-depth knowledge about your sector that will benefit organisations operating within the same environment. Clients may feel more confident about referring you because you can hit the ground running within their sector. Also, if it’s clear who your training business is aimed at, you will find it easier to aim your marketing at potential customers and for existing customers to make a referral. Above all else, referrals are born out of strong relationships. In a recent blog, we looked at why your existing clients are a fast track to a better training business. As well as being a source of repeat business, if you can keep current in your clients’ minds, maintain your visibility and make sure that the channels of communication stay open, you will boost your chances of receiving a referral. Let your clients know that referrals are welcome. Equally, you might consider referring your clients to other people in your network to show that you’re looking to benefit your connections as well as yourself. I can’t stress how important it is to recognise and thank your referral sources. A quick phone call or email may be sufficient, but a handwritten thank you card or note is better. People love to feel appreciated. Do you have set procedures in place to follow-up with potential clients, i.e. people who have made an enquiry about your training services, as well as past clients and people in your professional network? 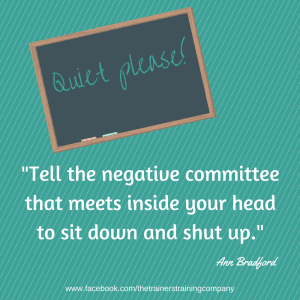 Or have you ever attended a meeting about your training services and felt as though you blew the client away with your pitch, only to never hear from them again? Often, the reason freelancers fail to seal the deal is a lack of follow-up. In this week’s blog, we’re taking a look at some of the most effective ways you can follow-up with potential clients and secure that signed training contract. When someone contacts you with an initial enquiry, make sure you pop a note in your diary to follow-up with them in a couple of days. You could even say in your initial response that you will be in touch on a specific day to check whether they have any questions at this stage. According to some of my contacts, Fridays are a good day to follow-up because people are more relaxed and positive thanks to the approaching weekend. There’s no set rule as long as you follow-up when you say you will. If you speak to a potential client on the phone or you meet with them face-to-face, you should always follow-up the enquiry by sending out any information you have promised. Try to do it as soon as you put down the phone or you’re back at work. This might be a copy of your terms and conditions or your contract, or additional information about your training services. One handy tip is to create a FAQs master document that covers common questions from potential and existing clients. Although you may have discussed a lot of the information in your meeting, giving a potential client a written FAQs document to refer back to can help refresh their memory. Even if you don’t need to send any additional information, I find it works well to email potential clients after a phone call or meeting and say something along the lines of, “It was great to meet/talk to you earlier today. Do you have any questions about anything we discussed?” and then reiterate some of the key points from the meeting, especially anything to which the client responded positively. If there was something you discussed in a meeting and you were both clearly on the same page, it can work well to mention this in your follow-up email. You could say, “As we discussed earlier, I agree that X, Y or Z would work well for your business and I am excited to explore this in the training”. This is a popular and effective sales technique, where you subtly remind the potential client that you share common ground. The more someone feels that your values and outlook click with theirs, the harder it is to walk away. Avoid starting any correspondence to a potential client with words such as ‘I wanted to follow-up…’, ‘I wanted to check in with you….’ In any business, clients are interested in what they want and how you can help them, not what you want. Again, it is a common sales technique to make sure that, before you conclude a conversation with a prospective client, you get them to agree the next step. This might be agreeing that you’ll send a follow-up email once they’ve had a chance to consult with others in their team, especially if they’re not the decision-maker, or agreeing that you will send a training proposal/pitch or quote by a specific date. Agreeing the next step removes any ambiguity about who needs to do what next, and when they need to do it. If someone has contacted you in the past to enquire about your services, you might want to contact them if you launch a new service or training programme that you feel would be a good fit for their business. I would suggest making this email, letter or phone call as personalised as possible. Remind them when they contacted you and what they contacted you about, and explain why you are contacting them. This doesn’t need to be a hard sell – you could let them know that you thought this information might be of interest. It shows that they are still present in your mind and keeps your business present in theirs. If you meet a potential client at a networking event or receive an enquiry, you could send an email to ask whether they would be happy to connect with you on LinkedIn and then follow-up with a personalised connection request that reminds them who you are and how you’re connected. This can be especially effective if you have recommendations from other customers and a complete profile, as it may help the potential client to understand more about your client base and how you can work with their business. If you publish regular blog posts and share them on LinkedIn, this can be a great way to build your reputation and show potential clients that you know your stuff. It’s not just potential clients we should all be following up with. Past and existing clients are ultimately where the money is. They know and have used your business – and have hopefully been happy with your training – and you already know they will pay for your services, so it’s important to stay fresh in their minds. You might do this by adding them to your mailing list (with their permission) and sending out a regular newsletter but sometimes the more personal approach can make a big difference. In these days of overcrowded inboxes, many of us are nostalgic for good old-fashioned snail mail, especially when the only things that drop on to the doormat are junk mail or bills. To give one of your past clients a warm glow, why not try sending out a handwritten thank you note, flowers or even an article from an industry magazine that you think might be of interest to them? A small but thoughtful gesture that says to past clients, “Thank you for your business. I value you as a client”, can be a great way to secure repeat work. Do you have a follow-up procedure for enquiries? What works well for you? How long do you leave it to follow-up with a potential client? I’d love to hear your thoughts in the Comments below. In my experience, success is more about mindset and attitude than any external factors. Success looks different for everyone and, while some people seem to have everything you might need for success – education, money, options, a strong support network – and yet never achieve their full potential, others overcome seemingly insurmountable odds to achieve their ambitions in life. The main difference seems to be attitude. While this applies broadly to people from all walks of life in all sorts of careers, I think all the ‘successful trainers’ I’ve met – and by that I mean people who run thriving training businesses, know their topic and have great rapport with their audiences – share a few common traits when it comes to their attitudes. “Do what you love and you’ll never work a day in your life”, that’s how the saying goes. It’s so true that if you have a passion for training – or anything else for that matter – you’re likely to work harder and view mistakes as valuable lessons. When trainers have a passion for their topic and the skills to communicate this passion, it’s contagious. I always think one of the truest signs of self-confidence is when a person works to build up the people around them with positive intentions and praise, instead of knocking people down to make themselves feel better. Usually, when we’re negative about someone or something, it’s because it hits a nerve inside of us. Self-confidence is knowing that people don’t have to like you and what you do because you’ll still be okay without their approval. Once you reach that realisation, it’s easier to look at how you can nurture other people without envy or insecurity. The world today is changing at an alarming rate and when you work for yourself, you quickly learn that you have to embrace change and learn to take risks. Otherwise, while you’re standing still, your competitors, customers and industry will move on without you. Embracing change can be incredibly positive because it means that nothing is permanent – if something isn’t working for you right now, you can change it. If your business needs to take a new direction, it can. The only risk when you’re freelance is not taking any risks. As trainers, I think most of us share a core belief that human beings are never done learning. As long as we draw breath, there will be new skills and knowledge to discover, which I find incredibly exciting. When we stand up in front of other people, we are part of a cycle of learning and development that can and should shape people throughout their lives. Walt Disney once said, “The difference between winning and losing is most often not quitting”, while writer, Stephen McCranie, said, “The master has failed more times than the beginner has even tried”. 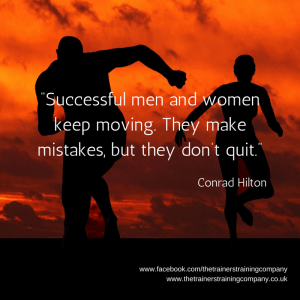 I think both of these quotes sum up the importance of persistence. We never know when success – whatever that looks like for us – is around the next corner. Whether it’s a big contract, a new opportunity, a new qualification or a change in direction, the persistent freelance trainers, the one with a stubborn streak who doggedly go after their dreams and ambitions, are the ones who succeed. It does seem as though people with a positive attitude tend to be more successful in life. Perhaps it’s that they view success in a different light or that they celebrate their successes; perhaps it’s that they’re more realistic about what success looks like rather than holding themselves to unattainable standards. It could also be that positive people tend to see challenges and mistakes as opportunities to learn and that they never lose their belief that they will succeed. Many successful entrepreneurs recommend taking time every day to celebrate not just achievements but things you perhaps take for granted, even if it’s just that, after a really bad day, you got through it in one piece! It might have to be a slow, deliberate and even painful exercise at first, but keeping a gratitude diary or naming things that are good in your life can help you make a shift in whether the glass is half empty or half full. I think it’s incredibly important to stop comparing yourself to other people because ‘comparisonitis’, as I like to call it, can take you down a bad road. When you compare yourself to colleagues or competitors, you’re not taking into account that you only know what they want you to know about their reality, i.e. what they choose to present to the outside world. You’re also ignoring your importance as an individual, which is what makes your training business unique. In my opinion, successful trainers understand their marketplace but they don’t get bogged down by what everyone else is doing. It’s far better to do what feels right for you. 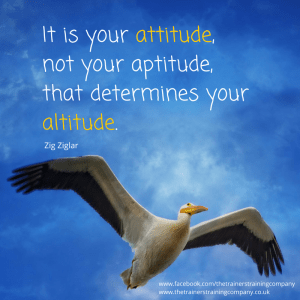 What attitudes do you think are essential for success? What does success look like for you? Is there anything you struggle with – perhaps you find it hard to stay positive or embrace change? I’d love to hear your thoughts in the Comments below. No. It’s such a small word, isn’t it? One that can have a massive impact but, for a lot of freelance trainers, can be a hard word to say. I imagine it’s because, as trainers, we tend to be interested in people. We’re passionate about communication and helping others reach their potential, so saying no can really go against the grain. We worry that if we say no, we’ll seem like we don’t care. If you’ve come from the corporate world, you may not have had to say no in a work context before, especially if you had an assistant or junior team members who would field and respond to enquiries on your behalf. They may have had the job of saying yes or no for you. 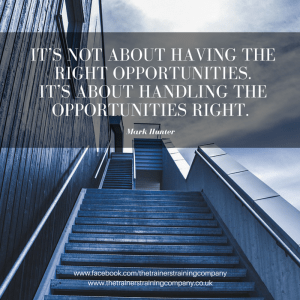 Once you become your own boss, it may not be long before you’re faced with whether or not you say no to something – be it a potential opportunity, a training contract, a fee, or being asked to discount your services. When you’re starting out it can be tempting to say yes to everything that comes your way. After all, you reason, who knows where the next training contract may come from? Perhaps if you discount your services now, you can secure more bookings in the future? Everyone has to make compromises in the beginning, don’t they? Not necessarily. I’m a great believer in starting as you mean to go on, and also that it’s never too late to change. Through personal experience, I’ve learned that saying yes in the wrong situations can lead to long-term problems that can be bad for business and you. What happens when you don’t say no? Other people set the agenda – In work, as in life, we all have our own priorities. The problem is that when someone comes to you with ‘a small favour’ or asks you to discount your training rates, for example, saying yes means that you are giving other people’s priorities precedence over your own. I imagine that you’ve spent a lot of time calculating what to charge to cover your costs. If you suddenly reduce your fees, your life may become much more of a financial struggle, driving you to work longer hours for less money. This may mean that you have even less time to grow your business because you’re too busy helping other people to grow theirs. It’s hard to establish boundaries – If you say yes to everything that’s asked of you, people may not recognise that they’re overstepping your boundaries. How can they if you don’t let them know what your boundaries are? For example, if you answer emails late into the evening or over the weekend, your clients may come to expect that you’re contactable at any time. Saying no can be a gesture rather than a word, and refusing to answer calls, emails or messages out of hours is a strong statement that you are your own boss. A common challenge for freelancers who work from home, whether all or some of the time, is that friends and family are inclined to drop by unannounced for a cuppa or phone for a chat in the middle of the day. It’s OK to let them know that you’re at work and would like to arrange a time when you’re not working to catch up with them properly. You’ll feel put upon – This happens a lot to people who never say no. A feeling of resentment can grow, and you may end up feeling frustrated, stressed and invisible because you’re overloaded and people are still asking for you to do more for them. Self-care gets neglected – When you’re always letting other people set your agenda and you’re overloaded with work-related tasks for clients, it’s very common to put time for rest, relaxation and recharging to the bottom of your to-do list. Instead of eating healthily, you may snack at your desk or eat quick high-energy, low-nutrient foods for a speedy sugar rush. And exercise? Well, you don’t have time for that, you’re too busy working! 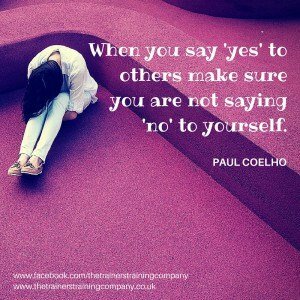 You won’t be able to say yes when you want to – Sometimes opportunities come along that you want to grasp with both hands and shout a resounding ‘yes’ to. The problem is that, if all your time is taken up with tasks and activities that you wish you’d turned down, you won’t be able to say yes when something really important to you comes into your life. I think it was when I realised this final point that I began to see how important the word ‘no’ is. It’s OK to turn down a training contract that doesn’t feel like a good fit for you or the business. It’s OK to refuse to discount your prices. It’s OK to say you’re busy or to walk away from something that, although an opportunity to someone else, isn’t right for you at this time in your life. Because every time you say no, it means that you are giving yourself the potential to say yes to something that really matters to you. By having the confidence to say no when a yes doesn’t feel like the right response for you, I believe that you are making a statement – well, several statements. You are telling friends, family, clients and colleagues that you have clear boundaries. You are telling other people that you respect them and yourself, and that you value honesty and integrity. Your clients will come to know that when you say yes, you really mean it, and that you don’t say yes to everyone – this means that when you say yes, it counts for more than if you never said no. When was the last time you said no? Do you struggle to say no? This week, I’m challenging you to listen to your gut instinct – are you saying yes because you want to or because you feel you have to? Give yourself permission to say no sometimes. It might just be the most important word you ever say! ‘Skill fade’ is defined as ‘the decay of ability or adeptness over a period of non-use’ – in other words, it’s when your skills get rusty over time. Skill fade is a topic that is talked about frequently around medical and army personnel where a career break – perhaps to have children or work as a volunteer – can affect how competent a person is at performing their life or death job when they return to work. Although, as a freelance trainer, your role may not be a matter of life or death, skill fade can be a very real concern, especially if you’ve taken a period of maternity leave, recently changed careers or you’re coming back to training after a period in industry. Often you may be brought into a company to help its employees address this very matter but skill fade can affect trainers too. Research would suggest that there are some tasks, like riding a bike or swimming, that, once learned, are hard to forget. More complicated, less predictable tasks, such as using algebra to solve a mathematic equation, are much easier to forget unless you use algebra on a daily basis. In other words, if you don’t use your knowledge, you lose it. Studies show that various factors affect whether or not we experience skill fade. The interval between learning and having to recall your knowledge is crucial, so the longer the period of non-use, the greater the chances that you’ll forget. Overlearning can be a problem too. This is when you take your knowledge beyond competency, reviewing the same information over and over again, instead of learning something new that adds a new dimension to your existing knowledge. With overlearning, people tend to either become complacent about what they know, eventually missing important details, or they become so caught up in achieving perfection that it can cause high levels of anxiety and a feeling of always falling short. Other factors include the type of task you’re trying to repeat, what you excel at, how you learn, and the conditions of your memory retrieval. For example, many people are better at recalling knowledge within a specific context or when the knowledge was gained in a real-life scenario. This is why practical training and on-the-job tuition can be more effective than lectures and classroom learning for many trainees. It’s also interesting to note that there is a growing hypothesis that computers and automation are speeding up skill fade, letting us become passive observers instead of active participants. Pilots have made fatal mistakes when the autopilot has disengaged; doctors have been known to miss crucial information by relying on diagnosis software; and what of athletes who’s heart monitors tell them they’re fine to carry on training when their body is telling them otherwise? For trainers, automation may have less dramatic consequences but, from relying on the spell checker to proof your training materials to giving trainees access to e-learning materials that require minimal teaching input, your attempts to streamline your workload could be negatively affecting your skills and knowledge. A study into skill fade among doctors found that skills decline over a period of non-use of six to 18 months. However, people were better able to retain their knowledge when they kept in touch with their peers, stayed aware of developments in their profession, and had a high level of learning and proficiency prior to their career break. It may be that you have certain skills that you are unlikely to use in the future – perhaps a topic you no longer want to cover in your training or a training technique you no longer find useful. If that’s the case, you may deliberately choose to let those redundant skills fade so that you can focus your energies on learning new skills or keeping your more important skills current. If you are worried that some of your existing skills are becoming rusty, it’s a good idea to pinpoint which ones and re-engage with them. 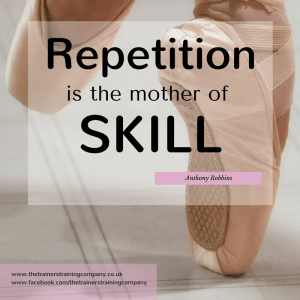 Try creating some flashcards about your knowledge or revisiting your own training notes, as repetition is the best way to stop a skill from fading. Even simple steps such as printing and reading your training workbooks out loud instead of relying on the spellchecker for coherence or offering trainees a VIP one-to-one mentoring session could help you keep your skills up-to-date and your training approach fresh. Have you ever been affected by skill fade? Do you have skills that you would like to update or are there skills you’ve decided to fade? I’d love to hear more about your experiences in the Comments below. One of the things that can hold you back as a freelance trainer is negative self-talk. Who are you to charge that much? Who would want to book you for training? You’re not as qualified as that other trainer. What if the client doesn’t like your training proposal? 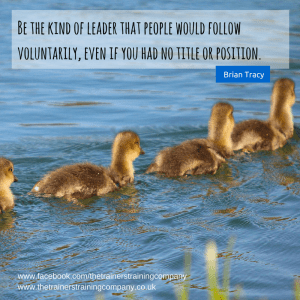 Will anyone hire you if you’re not part of a larger organisation? Can you earn enough money to successfully freelance? These are all common questions. Negative self-talk – to a point – can be a positive thing in that, if something is playing on your mind, it might mean you need to do some more work around it to put your mind at ease. Where negative self-talk becomes a problem is if it’s excessive and unkind. There’s a difference between, I could improve that training proposal before I send it and I’m so useless that there’s no way anyone will choose my training proposal, so what’s the point in sending it? Negative self-talk can make you live in a world of ‘what-ifs’ and a future that might not happen. It can impact on your self-confidence, client relationships and whether you say ‘yes’ to new opportunities. Research would suggest that, if you’re in a spiral of negative self-talk, forcing yourself to say positive things you don’t feel at that moment can actually make the situation worse because your brain detects what it perceives to be a lie and rejects the positive statements. Instead, experts recommend changing your self-talk to focus on possibilities because the language is more neutral. If you find yourself saying, ‘I’m not as experienced as other trainers’, try telling yourself, ‘I’m not as experienced at X, Y or Z as some other trainers at this point in time but I can gain experience by ….’ and attach a realistic step you can take in the right direction to that thought. Possible thinking shows that there are choices, opportunities and ways to progress from where you are now to where you want to be. Sometimes, a slight change of phrasing can make a big difference. If you are someone who says, ‘I’m so stupid’, you could try rephrasing it as, ‘I feel/felt so stupid’. There’s a whole world between how you feel and what you are – feelings come and go but if you perceive who you are as stupid/useless/worthless*, it’s much harder to let go of that definition (*delete or add to as applicable). You may analyse every situation with lots of criticism, especially in situations when you feel you could have done better. Perhaps a joke fell flat in a training session, you lost your train of thought or someone criticised you in their feedback – you may feel that everyone was looking at you and judging you for making a mistake or not being good at your job. Sometimes referred to as a ‘social post-mortem’, it can be tempting to re-examine every word you said or every gesture you made in a critical light, thinking of ways you could and ‘should’ have done things differently and berating yourself for what you feel you did wrong. This kind of thought process can often lead to feelings of shame and inadequacy. Instead, it can be helpful to think about the situation from a different perspective. Perhaps people didn’t notice your mistake? Or, if they did, maybe they were relieved that other people occasionally trip on their words? It might even be that they admired you for getting up and standing in front of a roomful of strangers – maybe they were thinking that they could never do that. They might not even have noticed you made a mistake because they were busy checking their phones under the table or panicking about whether you were going to ask them to talk in front of their peers! If someone has given you critical feedback, think about their perspective – is it constructive? Could you use the feedback to fine tune your services? If the person hasn’t been constructive, maybe they wanted to get something different out of the training that you couldn’t help with? Did they go in with unrealistic expectations or attend because their employer told them they had to? By shifting your perspective to acknowledge that people are often more concerned with their own thoughts than judging you in the self-critical light you view yourself, you can begin to dilute the negative self-talk. 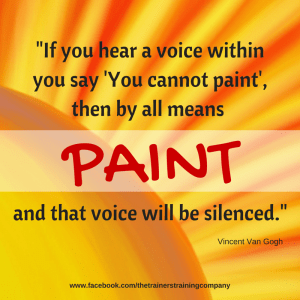 This is probably one of my favourite tactics for silencing my inner critic. In the past, I would say things to myself that I would never dream of saying to a friend, partner or child. Words that, if I heard them used between other people, I would consider cruel and even abusive. It often strikes me that we can show other people a lot more kindness and compassion than we can show ourselves. Therefore, I always try to answer my inner self-critic with the voice of a friend and I try not to say anything to myself that I wouldn’t say to someone I love or respect. The next time you think something negative about yourself, reframe it by asking, What would I say if someone criticised my friend like that? How would I answer the criticism and lift their spirits? Would I talk to a friend like that? If not, what would I say instead? Negative self-talk often comes about when we’re striving for something and see ourselves as falling short. Some of the most self-critical people are those who hold themselves to impossibly high standards. Unfortunately, if you’re seeking perfection, you’re destined to always fall short as it doesn’t exist. And, even if it did, how would you recognise it? Everyone has different perceptions of what it means to be perfect. It’s unlikely to hear a famous athlete, CEO or public figure attribute their success to perfectionism. Instead, they are prepared to make mistakes and try and try again, bettering themselves over time with all that they learn and accepting that they’ll mess up sometimes. Gently remind yourself that you would never have learned to walk, speak, read or write as a child without making mistakes along the way. Mistakes give us an opportunity to improve, whereas – if you were perfect – what would you have to strive towards? Do you have a noisy inner critic or do you have techniques that you use to silence yours? I’d love to hear your thoughts in the Comments below. Do freelance trainers need qualifications to get work? In my experience, people tend to sit quite firmly on one side or other of the experience versus qualifications debate. There are those that believe industry, training and life experience counts for more than paper qualifications, while others argue that setting up as a freelance trainer without provable qualifications devalues the role. With the intention of throwing an objective light on the debate, I can safely say that I’ve encountered individuals with a list of qualifications as long as their arm who fail to engage their audience, while others with no qualifications have held their trainees captivated with their real world experience. On the flipside, I’ve met people who have worked at the coal face of their industry but just can’t translate their experience into training. Some people wow crowded rooms, while others work best with small groups or on a one-to-one basis – qualifications rarely influence this, although they can boost your confidence in certain settings. As with so many things in life, I’m convinced there is no one-size-fits-all approach to effective training. Whether or not you hold any training qualifications, your priority as a freelance trainer should be to work out what sets you apart from the crowd – i.e. HOW you work and WHO you are – and how to demonstrate and communicate your quality. My recommendation would always be to look at ways you can customise your training services to each client. If you offer an off-the-shelf training product that’s the same for every client, the only thing that will distinguish you is the price that you charge and, when presented with identical offerings, clients tend to opt for the lowest price. If you can demonstrate that yours is a bespoke solution, designed around the client and bringing your extensive experience into play for their benefit, you will be better placed to secure a face-to-face meeting and charge a higher rate, regardless of your qualifications. Of course, if you are a member of a professional organisation or have training qualifications, certification and references, this can help you stand out from your competitors and rubber stamp your reputation. For some clients, especially those in the public sector, your training qualifications may tick a box in the tendering process that secures you a contract. It’s also fair to say that showing a commitment to your own Continuing Professional Development (CPD) makes a statement to your clients that you practice what you preach, that you’re constantly striving to grow, and that your knowledge is current. CPD can be a minefield for freelance trainers. When you were in gainful employment, you probably didn’t blink an eye at heading off to a £1,000 CPD residential course but now that you’re footing the bill for your own training, you may be more circumspect. Before you invest in CPD, it’s important to consider how long you are expecting it to take before you see a return on your investment? Will the CPD pay for itself eventually? How will it improve your business? Some freelance trainers prefer to look for other ways to develop their knowledge – this might be by running a mastermind group or by investing in diagnostic tools to help businesses come up with a prioritised action plan based on a strategic overview of their organisation. There’s no doubt that qualifications are important to some clients and industries. It’s worth reaching out to your potential clients and asking them how they view qualifications versus experience. They will respect the fact that you are building your business based around your clients’ needs. And this is crucial – as freelance trainers, we need to think about our clients’ needs first, then offer solutions second, not try to fit template solutions to our clients. Ultimately, qualifications aren’t essential if you can show where you have made or can make a difference to your clients. As with most purchasing decisions, your clients want to know what’s in it for them, so your challenge is to make your training proposition so compelling, it’s a no-brainer to hire you. You may find they don’t even ask about your qualifications. 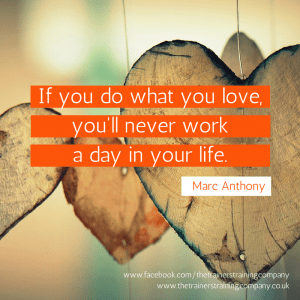 Are you a freelance trainer? Where do you stand on the qualifications versus experience debate? Do you have professional training qualifications and have they been important to your career progression? 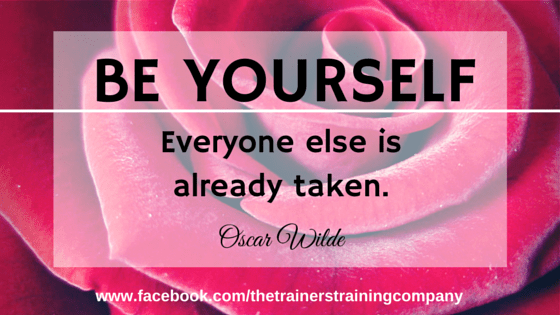 Are you a freelance trainer without training qualifications? Has this held you back in any way? I’d love to read your thoughts in the Comments below. Do freelance trainers need a personal brand? In marketing terms, branding is anything – from your business logo to your tone of voice – that identifies you and helps you stand out in the marketplace. Although branding has always been an essential part of running a successful business, there is increasingly an emphasis on building a personal brand as well as, or even instead of, your business brand. Why? Because ultimately people like to do business with, and buy from, real people. If you’re about to set up a freelance training business, you may be trying to decide whether to create a business brand or concentrate on building your personal brand, which might mean using your own name as the name of your business. If you already have a business brand, is it worth creating a personal brand too? As with most things in life, there are two sides to the argument. Personal branding can be incredibly important if you are a freelance trainer who works without the support of a team. By building a personal brand, you can create expectations with clients about your values, skills, experience and what it’s like to work with you. The difference between whether or not you secure a training contract can come down to chemistry with your clients – do they feel you will personally be a good fit for their organisation? Building your personal brand can help you build a positive first impression. Many experts feel that building a strong personal brand can open up professional opportunities. When people make referrals or recommendations, they can look to your personal brand as a signpost to the qualities you bring and, if people come to recognise your personal brand, this will help you build your reputation as an expert within your industry. Personal branding can keep you and your authenticity at the core of your business, and help you build on the ‘like, trust and know factor’ that is key to bookings, repeat business, and referrals. For the sake of transparency, if you do decide to build a personal brand, you should create most of your own content as people expect personal brands to come with a personal touch. That’s not to say you can’t outsource key tasks but you should maintain a high level of input as customers of your personal brand will expect this. As a solopreneur, you might find it harder to gain traction with a personal brand initially as people won’t know who you are or what you do, whereas a business brand can make this more obvious. Over time, however, a personal brand has the appeal of a backstory, history and personal involvement that clients engage with. An extension of that is that, if you build your freelance training business around your personal reputation, people will expect to deal with you personally. While this is fine for solo freelancers, if you plan to develop a high growth business, expand your team, work with associates or even sell your training business one day, being known for your personal brand could be a hindrance. After all, if you are no longer part of the business or behind the scenes, does the business have the same value to customers who were drawn to your personal brand? If your vision for the future includes a wider team, you may want to concentrate on growing a business brand that has more scope for growth. If you’re a shy person, being known for your personal brand may make you feel too exposed or vulnerable. It’s also important to consider that in the unlikely event of negative publicity, criticisms could follow your personal brand (and consequently, you) like a bad smell. When building your personal brand, it’s worth thinking about your name. Do lots of people have the same name? Is it difficult to spell or remember? Is your name available as a website domain? This could even be a deciding factor. If someone else has built their personal brand around the same name as yours or people will struggle to spell your name, you might decide to build a business brand instead. 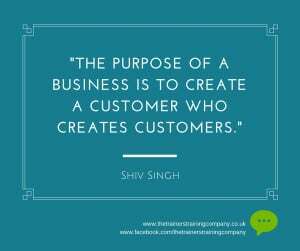 How much do you want to be involved in your business? How long-term are you thinking? Are you looking for an exit? If you want to remain a solopreneur/freelancer, build your professional reputation as an expert and don’t have plans to sell your training business, then you may decide a personal brand is the way forward. If you’re focused on high growth, stepping back from the daily running of your business or selling it as a going concern in the future, then a business brand would be the more logical choice. Do you have a personal brand as well as, or instead of, a business brand? Has this helped or hindered your career as a trainer? How do you respond to personal brands? Is there anyone you follow because of their personal brand? I’d love to hear your thoughts in the Comments section below. 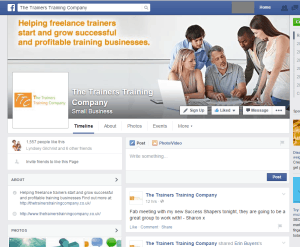 In last week’s blog, we looked at using Facebook to build your training business. Continuing on the social media theme, this week I wanted to take a look at how LinkedIn can be a fantastic tool for building your network and your reputation. According to the latest stats (March 2015), LinkedIn has approximately 347 million users worldwide, making it the seventh most popular social network and the world’s largest professional network. There’s no doubt that LinkedIn is the ideal place to network professionally, find jobs, answer questions, and build thought leadership. So, what could you be doing on LinkedIn to build your training business? If you don’t yet use LinkedIn, your first step would be to create a profile. Go to www.linkedin.com and sign up using your name, email address and a password. Once you log in to LinkedIn, you will see that your main profile screen is structured in much the same way as a CV, with a summary statement, then sections about Projects, Skills, Experience, Education and Additional Information. Whether you’re new to LinkedIn or you’ve been using the platform for a while, it’s a good idea to think about what keywords people might use to search for a trainer like you. Try to use these keywords strategically throughout your profile (in much the same way as you would on your website), especially in the 120-character headline that appears underneath your name at the top of the page. If it’s been a while since you’ve updated the static elements on your LinkedIn page, now is a good time to look at them with fresh eyes. Do they still convey what your training business is about? Do they show how you can make a difference to your training clients? Has your business changed and evolved? Are there different skills or experiences that you would like your profile to highlight? LinkedIn isn’t a do-and-leave kind of platform – like your career, it should be constantly evolving and updating to reflect your development. One of LinkedIn’s main functions as a networking website is to help you benefit from the principle of six degrees of separation, i.e. that we are all potentially connected to one another through the people we know. People who actively use LinkedIn to grow their business often find that they know someone who knows someone else who could really benefit from their services. Therefore, one of your aims should be to grow your LinkedIn network. It’s true that people on LinkedIn have become more protective of their networks in recent years, largely thanks to years of spam connection requests and messages. It is still possible to grow your network but you need to be savvy about it. One thing I’ve learned is that, unless you know the person well and don’t need to introduce yourself, you should never just send the template message that LinkedIn creates, which says: I’d like to add you to my professional network on LinkedIn. Instead, I would recommend personalising your request, reminding the person who you are and why you would like to connect with them, especially highlighting how you feel it would be beneficial to you both. Each time you set up an appointment to talk to someone about your training business or you receive an enquiry, let them know you would like to connect with them on LinkedIn. You could send a connection request on LinkedIn saying that you’re looking forward to talking more on <insert date and time> and that you’ve emailed them with all the details. If someone has viewed your profile and you share common ground, you might want to send them an introductory message explaining why you’d love to be part of their network. If there’s someone you follow on Twitter or Facebook and you have had a few interactions with them, you could try sending them a request to connect on LinkedIn, explaining that you follow them on whichever platform and that you would like to connect to be able to share their ideas with your network. Some LinkedIn users have reported great results from connecting with influencers who’ve published articles on LinkedIn. Their advice is to like and comment on a post, tagging the person to invite interaction, and then following up with a connection request that refers to the article and what you liked about it. You could also say that you’ve shared the article with your entire network and looking forward to engaging with and sharing more of their insights. At a networking event, you could try sending LinkedIn connection requests to people you meet instead of trading business cards (add a personal message to remind them where you met) or you could go through the business cards you’ve collected once you’re home from the event and find the people on LinkedIn. Rinse and repeat as often as possible. I find it helpful to set a goal of connecting with three to five people a week. It’s not enough to add people to your network on LinkedIn – after all, it’s the quality of your network that counts, not the quantity. 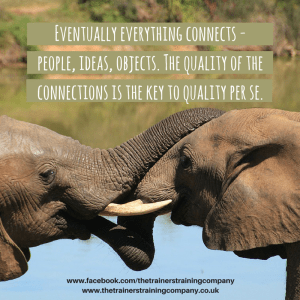 The next step to help you grow your training business is to nurture your relationships with your connections. The feed on your Home page will show you any new content people have posted to their own profiles. It’s a good idea to take a few minutes once or twice a week to like, comment on and share articles from people in your network. By regularly interacting with your contacts, you stay in the forefront of their minds, which means that the next time they need to hire a trainer, you’ll be the person they call. LinkedIn is developing more and more features to help you build your reputation as an influencer within the training field. You might want to ask your existing training clients to write a Recommendation for your LinkedIn profile or endorse your skills. Endorsing a skill is much like a show of hands, showing potential clients and connections at a glance that other people are willing to vouch that you can do what you say you can do. Recommendations act more like a testimonial or review and are excellent for reputation building. 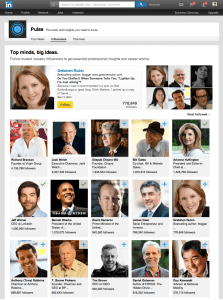 Write articles that showcase an aspect of your knowledge or insights for LinkedIn Pulse. You can write as many articles as you like and, as your number of followers grows, so will your reputation. Share articles that you think people will find useful – for example, if there’s a new law or regulation that will affect your training clients, share the information with them via LinkedIn. Use the LinkedIn Connect app as this will give you notifications about birthdays, job anniversaries, people in your network who’ve got new jobs, and much more. It only takes a minute to send a congratulations message via your phone but it will help you build your reputation as someone who cares about their network. Follow recognised thought leaders in your field to show that you have your finger on the pulse of your industry. 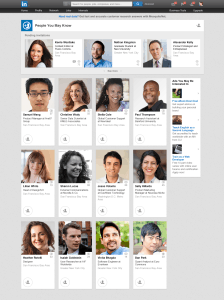 LinkedIn has a handy feature on your main Profile page, which shows you where your profile ranks within your network. This information can be found under ‘Who’s Viewed Your Profile’. Simply click on the information about whether your rank has gone up or down in the past 30 days and LinkedIn will give you some suggestions about how to boost your profile views and grow your network. You should find that after making some tweaks, your ranking will go up. If it starts to fall, it might be time to review your profile again. Do you use LinkedIn for your training business? I’d love to hear your experiences on LinkedIn in the Comments section below. If you’d like to learn more about using Twitter, you’ll be delighted to hear that Nicky Kriel will be joining me for a webinar on Monday 6th July 2015 to talk about how to get more business on Twitter. To make sure you don’t miss out on all her fantastic hints and tips, sign up for your place here. Sooner or later everyone who runs a business is told that they need to use social media to build their audience. It’s a topic I’ve covered in the past in a webinar about how to use social media to promote your training business. Personally, I’m a big fan of social media and have attracted many clients through my social media use but I know that some people are not convinced that it’s right for their business. You may be one of those people or maybe you’re keen to develop your social media strategy but you’re not sure where to start. 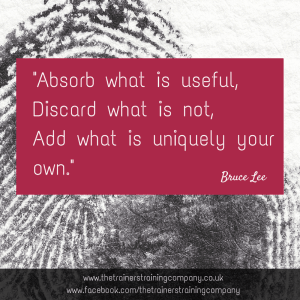 In this week’s blog, I wanted to look at using Facebook to build your training business. Why focus on Facebook specifically? Well, let’s start with a look at the numbers that matter to businesses on this social media behemoth. According to a recent post on the DMR website in May 2015 rounding up all the current stats available about Facebook from the company and in the media, there are now 50 million Facebook pages, 40 million of which represent small businesses. There are estimated to be over two billion connections between local businesses and their customers on Facebook; 645 local business pages are viewed every week and 13 million people take the time to comment on local business pages weekly. Figures would suggest that each click through from Facebook to a website is worth $1.24 (approximately 79p) to the business concerned, while other stats suggest that the amount spent per order by a Facebook consumer is $55 (£35 approx.). In the UK, 33% of people say they trust a brand more if it has a presence on social media and 47% of people believe that Facebook is the quickest social media channel to solve customer service issues. As we can see, Facebook continues to be ‘the one to beat’ when it comes to popularity and engagement, and it would appear that customers expect to see businesses on the platform. One of the most compelling stats that I’ve read is from a survey by G/O Digital back in August 2014, which found that approximately 60% of people check a company’s Facebook page before buying from them – this is particularly the case for people choosing a local supplier, product or service. The survey also found that 58% of people engage with advertising from small businesses on Facebook before making a purchase. Knowing that such a high proportion of people refer to Facebook as a decision-making tool, particularly looking for good reviews/testimonials and other positive feedback, I think it is important – even essential – to have a Facebook presence for your training business. 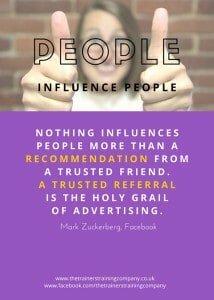 As we can see, using Facebook as a marketing tool has many advantages – the users are there, people expect to find businesses on the platform, and engagement can build trust, reputation and sales. On the flipside, one of the biggest challenges for Facebook page admins is how to build engagement without a big budget. The first step is to get people to like your page but to do this you need to create targeted content that people want to like, comment on and share with their wider network. Unfortunately, Facebook’s algorithms mean that not everyone who likes your Facebook page will see what you post. People have to keep interacting with your page if they want to see your content but how can they do this if they don’t see what you post? Many people feel this is a vicious cycle for small business pages. There are several ways around this. It’s important to be strategic about using Facebook to build your training business. Are you trying to build your reputation? Do you want people to click through to your website and book? Do you want to build your network? By understanding who you want your Facebook page to appeal to and why, it’s far easier to create content that the right people will want to like, comment on and share. Once a person starts regularly interacting with your page, they should see your content more often. In terms of maximising your organic reach, I’ve found that the best strategy is to be consistent. It is better to post on a daily basis (preferably several times a day) as, when you leave your page silent for days or weeks at a time, your organic reach can significantly drop off when you become active on the page again. 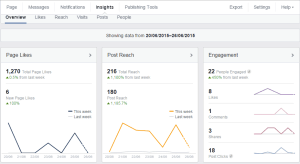 The Facebook insights that you can view as the ‘Admin’ for your page will help you identify your most popular posts. Are they statuses, photos, questions, videos or something else? Through the insights, you can see which content gets shared, what attracts comments or likes, what time of day people use your page, the demographic of your audience, and much more. Recent stats suggest that Fridays are the best day for engagement on Facebook but you might find that another day and time is better for your business, depending on the demographic of your likers. There’s a fantastic free tool at www.likealyzer.com, which helps you monitor and analyse how your Facebook business page is performing. Simply pop your Facebook page’s URL into the search bar and Likealyzer will give you a breakdown of what you’re doing well, where there’s room for improvement and some recommendations that should make a difference to engagement. When people do engage with your page, it’s important to respond quickly and professionally – answer messages as soon as possible, like or reply to comments, and make it clear that there’s a human being behind the page. 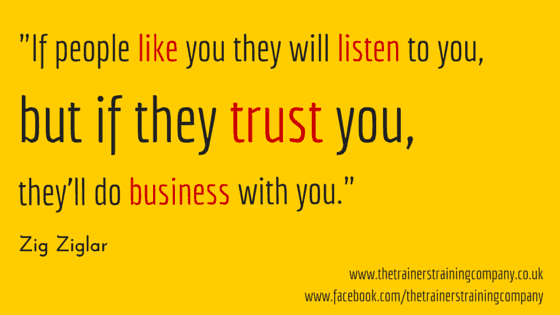 I think this is especially important for training businesses as clients are looking for rapport with their trainers. With 890 million people signing into Facebook every day, you may reach a point when you want to consider boosting important posts or paying for Facebook ads, which can be carefully targeted to your high value clients to make the most of your advertising budget. Hubspot recently posted an excellent blog about creating Facebook ads that work and I found this cheat sheet from Purrfectly Social about using Facebook’s Power Editor. Many businesses agree that, once you get to grips with Facebook ads, they are incredibly effective. The ability to set up a group on Facebook is great news for freelance trainers. Creating a group is quick and easy – you can make it open to anyone, closed or even secret, so you decide whether you have an open door policy to grow your network or whether you want to invite select members in for collaboration and networking. Facebook groups are free to create and run, and you are able to set the agenda. You might want to create a mastermind group, a group for associates, a networking group, a group for clients…the options are endless. Alternatively, you could join an existing group. I find that being active in groups, responding to questions and generally being recognised as someone who wants to support other people can be a good source of recommendations and referrals. Using Facebook for business is a topic that could run and run. I know a major concern is the amount of time that you can waste on social media, which is why I always stress that it’s important to be strategic and use any social media platform with a plan. Facebook has a scheduling tool to enable you to schedule your posts in batches so you don’t have to be on Facebook throughout the day. I usually plan my posts in an Excel document and spend 10 minutes at the end of the week scheduling ahead. I also add in some spontaneous posts throughout the week. Another helpful tool is the Facebook Pages Manager app, which lets you manage every aspect of your Facebook page from your phone or tablet – great for when you’re out and about. I’ll be looking at using other social media platforms to build your training business over the next few weeks. If you’d like to learn more about using Twitter, you’ll be delighted to hear that Nicky Kriel will be joining me for a webinar on Monday 6th July 2015 to talk about how to get more business on Twitter. To make sure you don’t miss out on all her fantastic hints and tips, sign up for your place here.